Historic Hilo hangs as loose as a hula dancer's hips, so loose some of it appears ready to topple. But sidewalk planter boxes, arty signs, and old-timey storefronts attest that the town is on the up-tick. 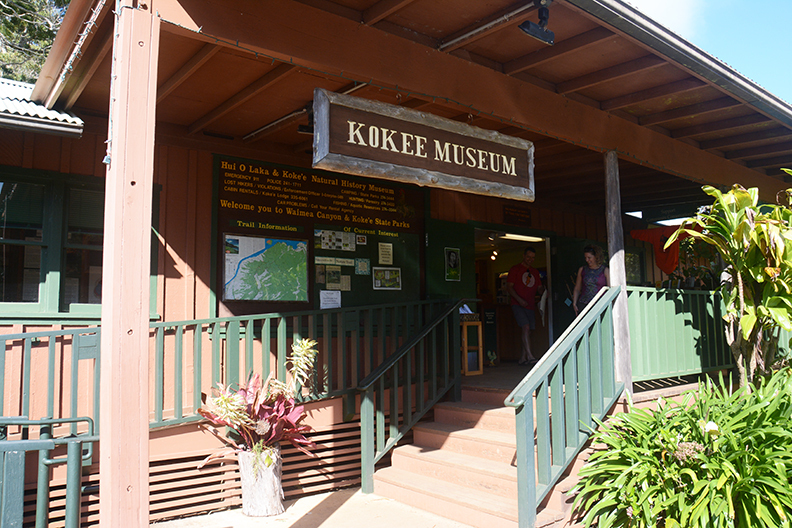 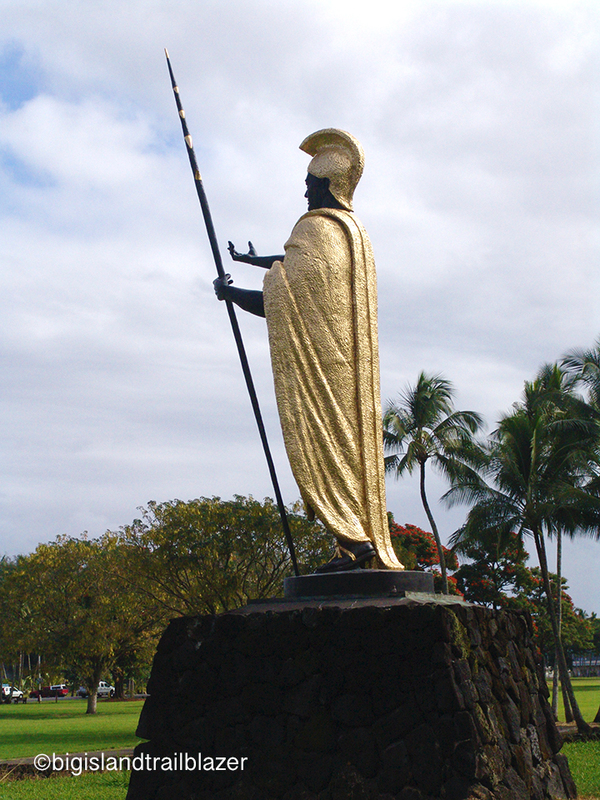 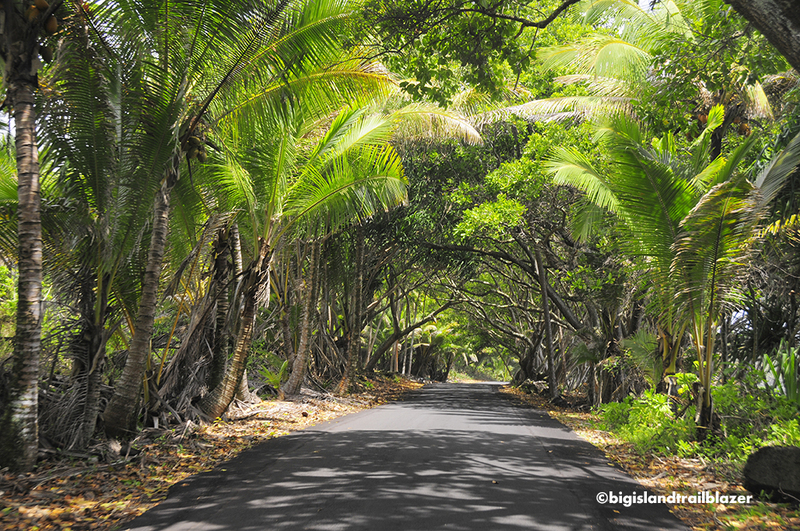 A mile from old town is Wailoa River State Recreation Area, where a gilded statue of Kamehameha the Great presides over acres of greenery. Curving footbridges span the river—the shortest in the world at one-third mile. 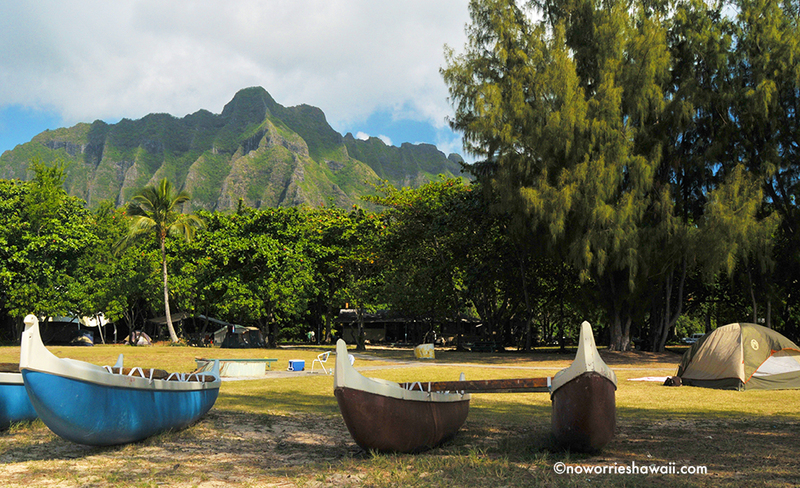 Just offshore—reachable by a footbridge—is the tiny Moku Ola (a.k.a. 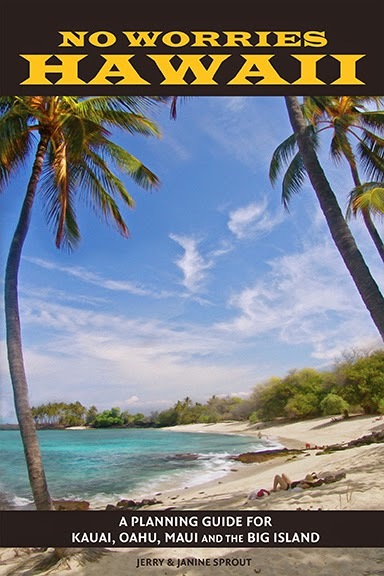 Coconut Island), ringed by a tiara of palms. 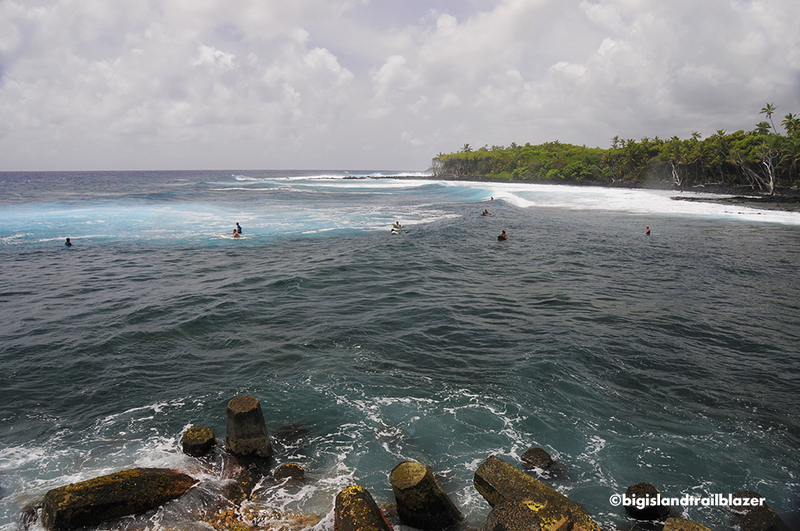 Swimming is excellent, in waters historically known for healing properties. 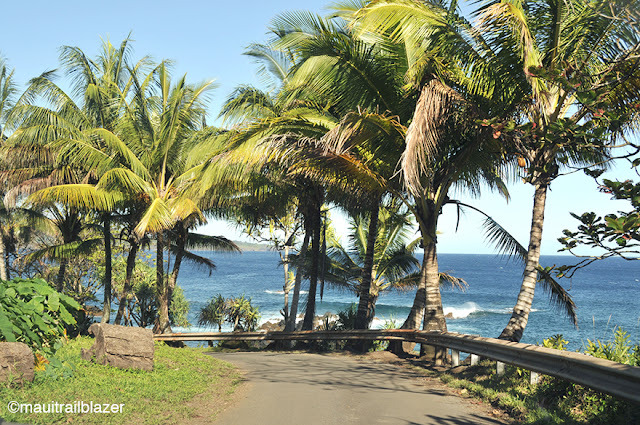 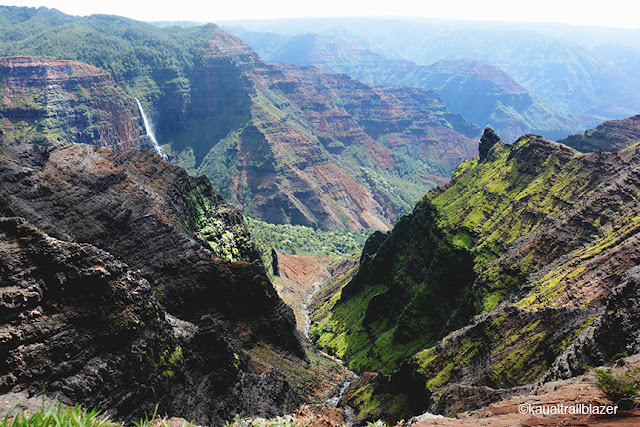 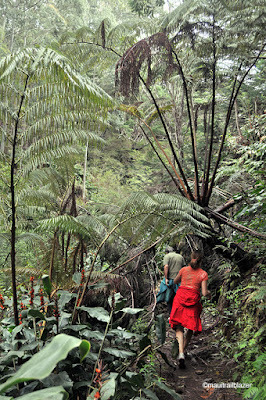 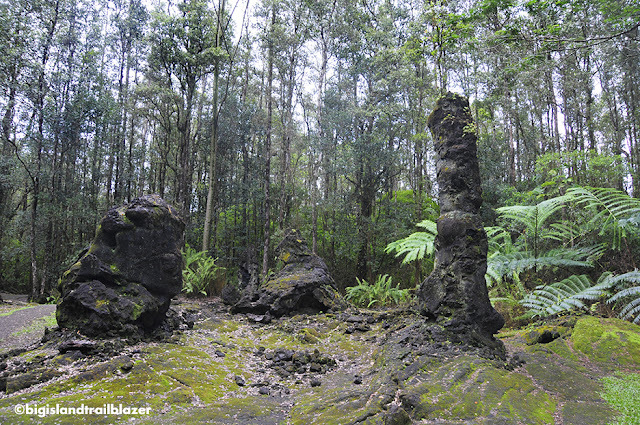 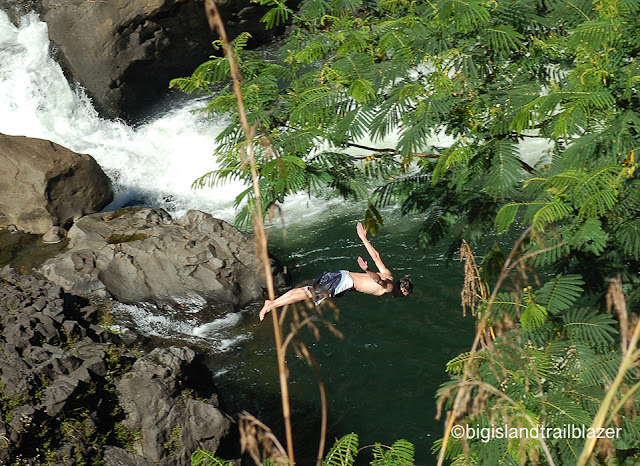 The view inland is a gong-ringer: Rising above Hilo are the island's twin giant peaks, Mauna Loa and Mauna Kea. The little island is on the grounds of Liliuokalani Gardens. 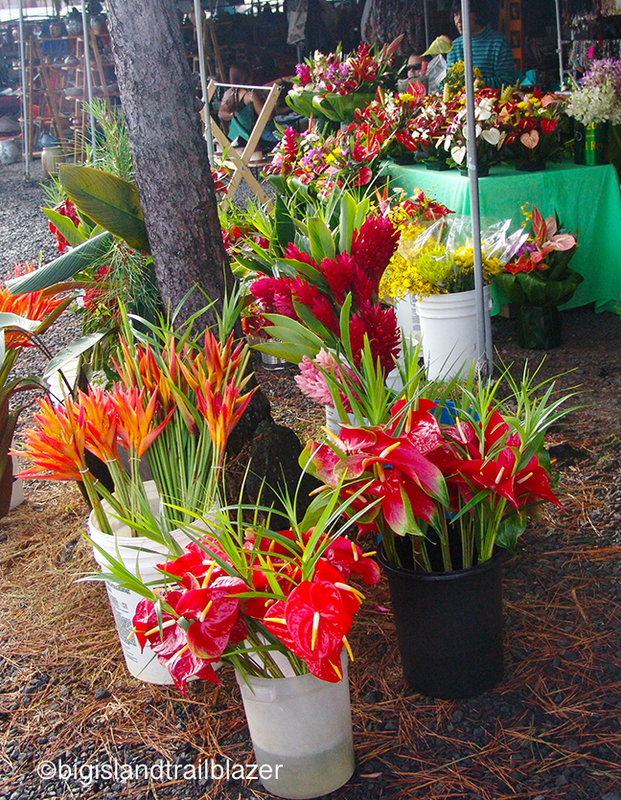 The Hilo Farmer's Market—the best in Hawaii—takes place Wednesdays and Saturdays, when more than 200 growers of fruits, veggies, and flowers load tables with low-priced goodies. Crafts are also on display. 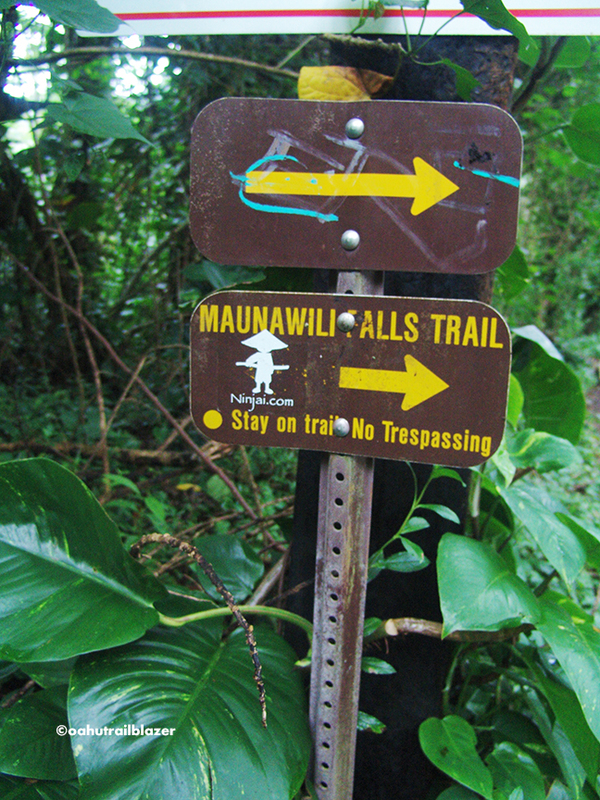 A smaller version of the market happens daily. 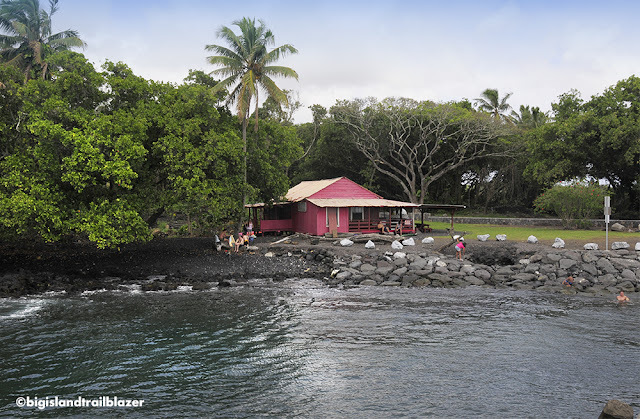 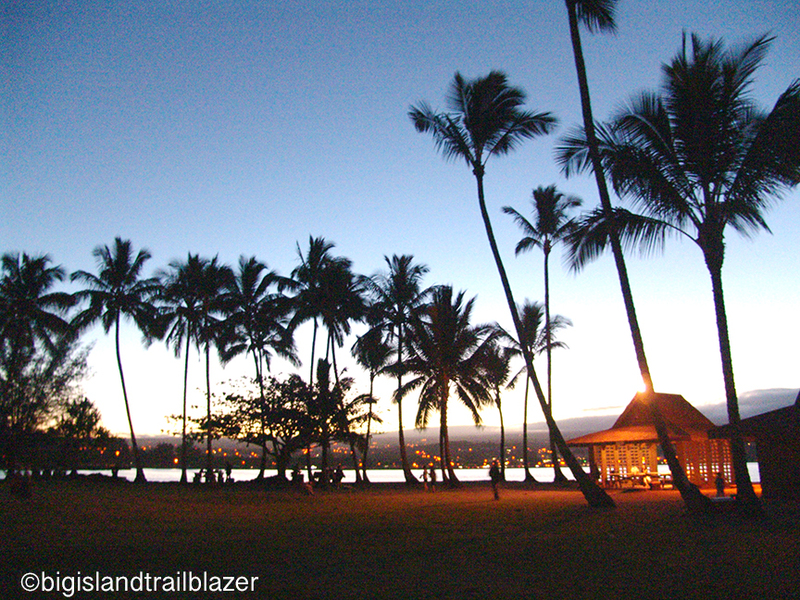 Across the street from the market and Historic Hilo is Bayfront Park. 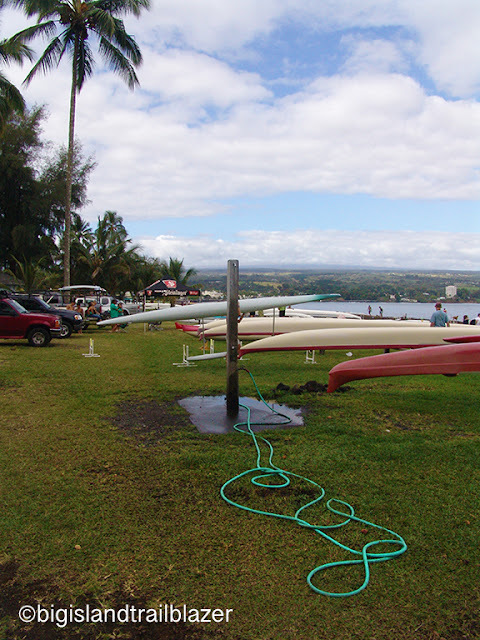 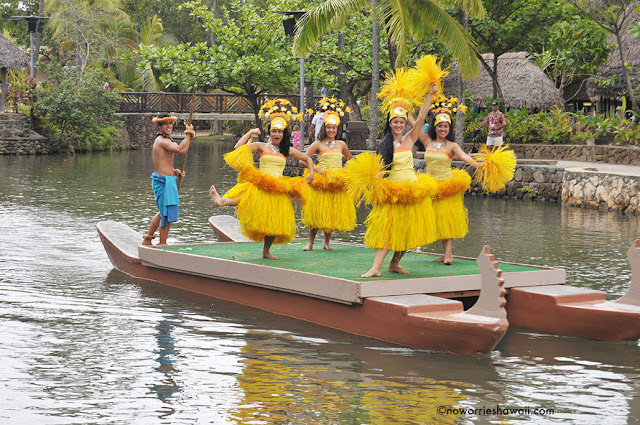 Outrigger canoeing is part of the community, and fun to watch. 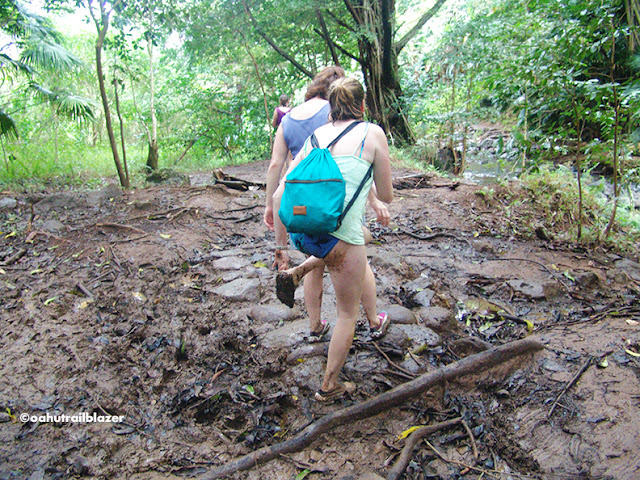 Gushing through the center of Hilo is the Wailuku River, running down from the saddle between Mauna Loa and Mauna Kea. 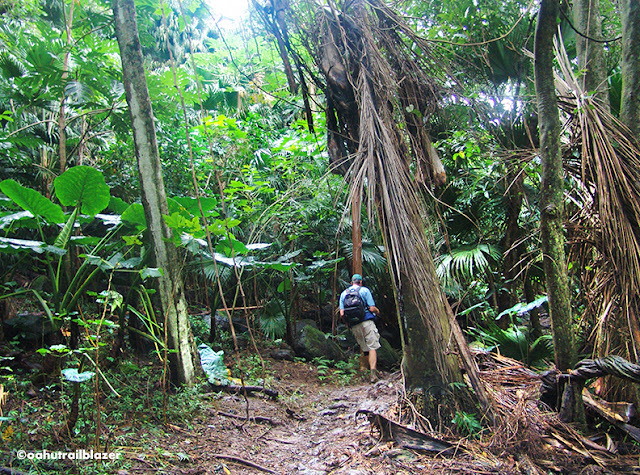 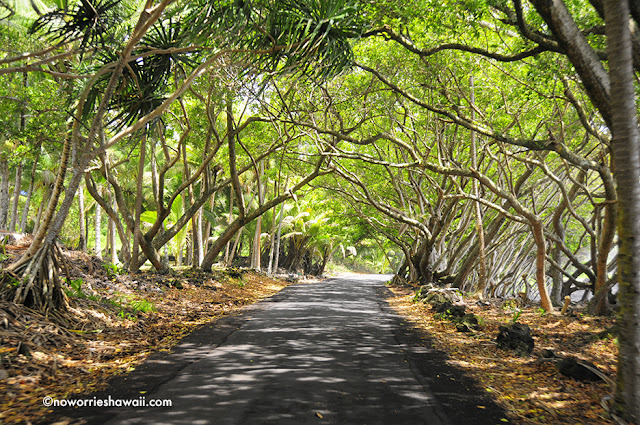 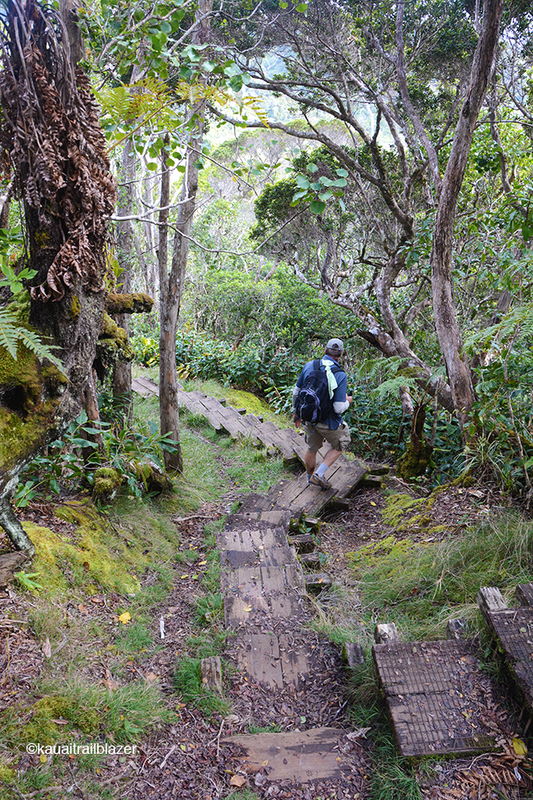 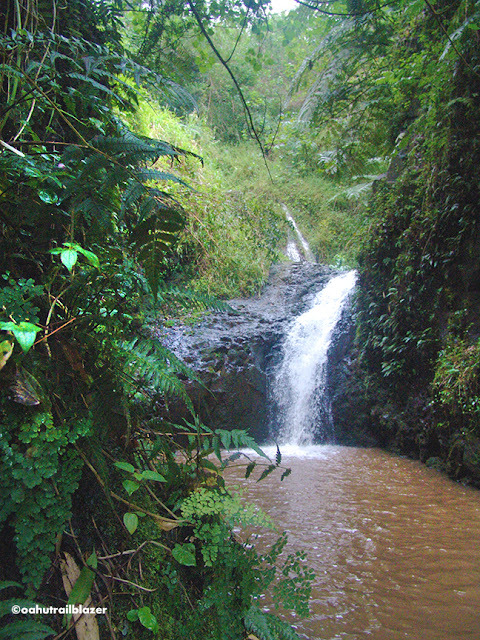 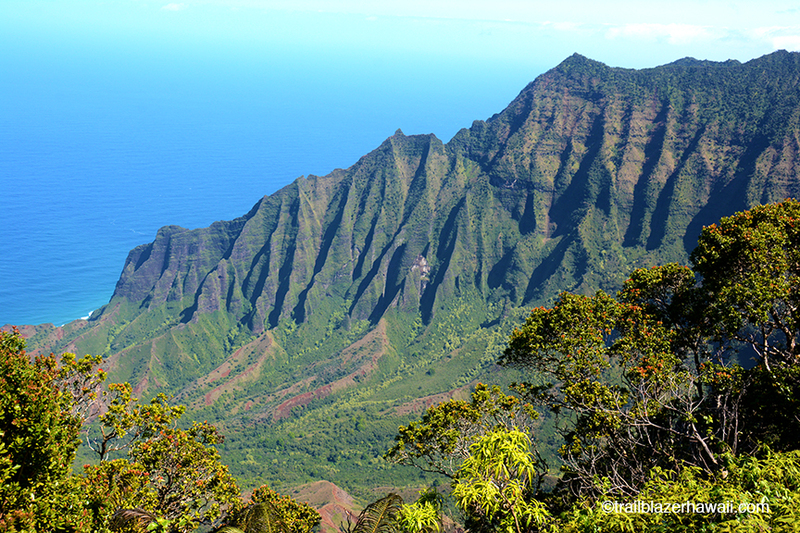 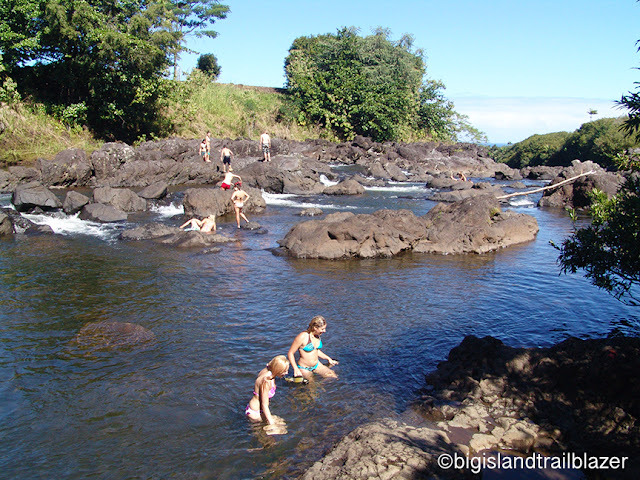 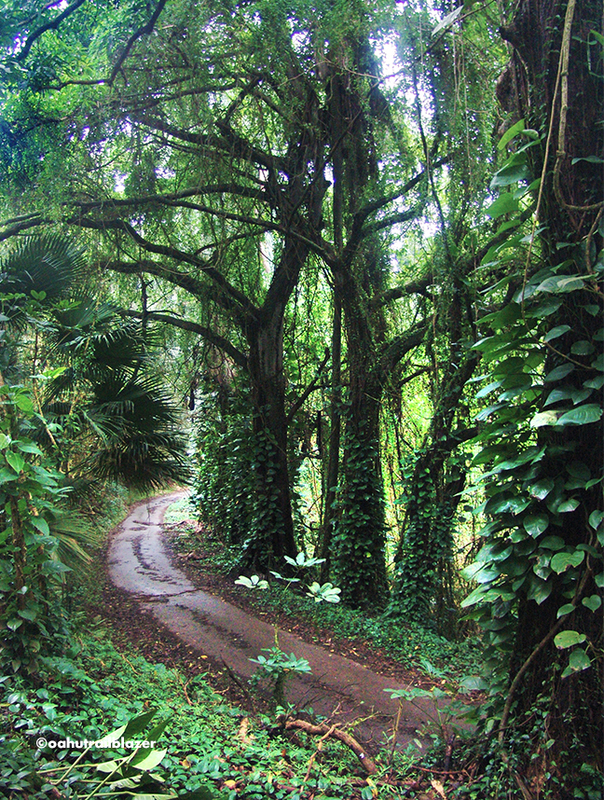 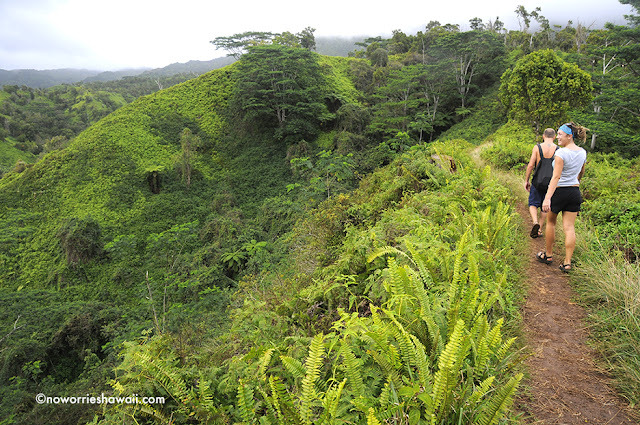 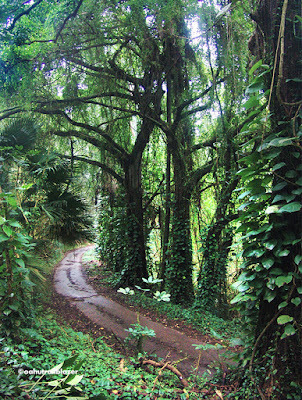 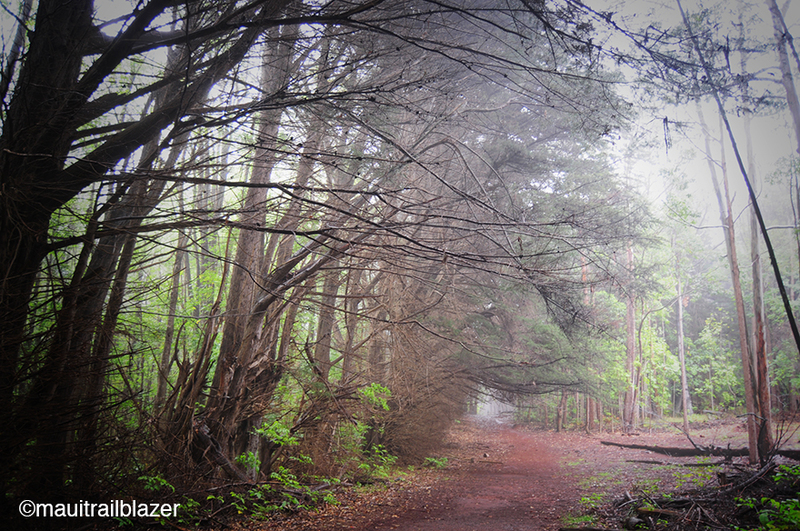 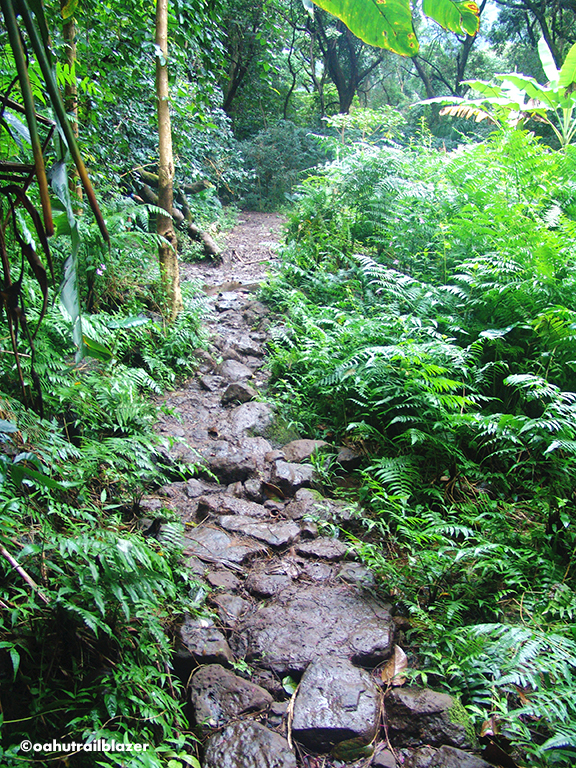 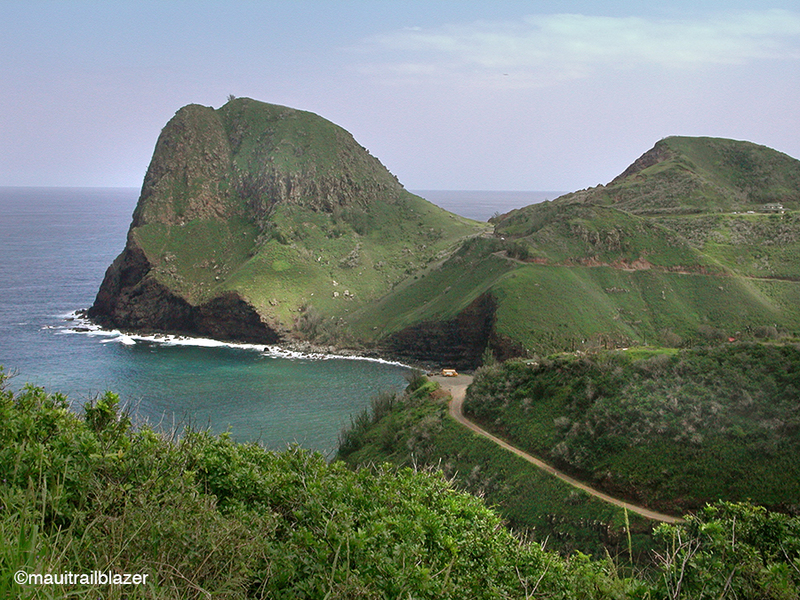 Wailuku River State Park is a five-minute drive from town. 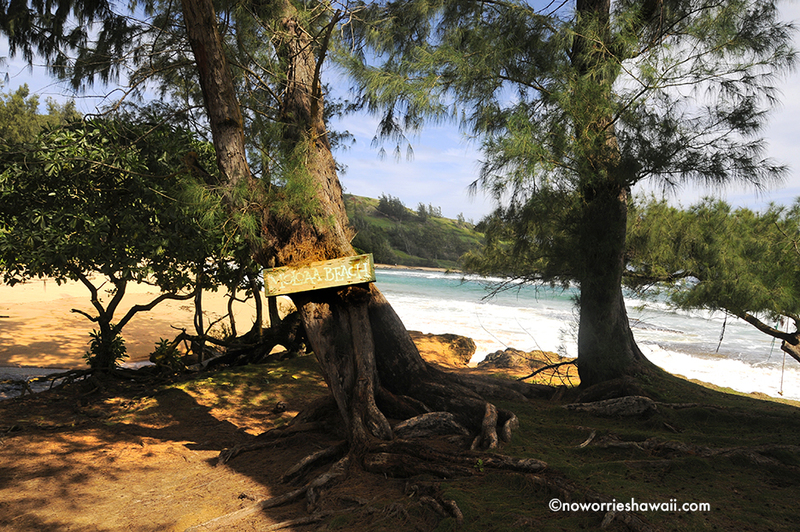 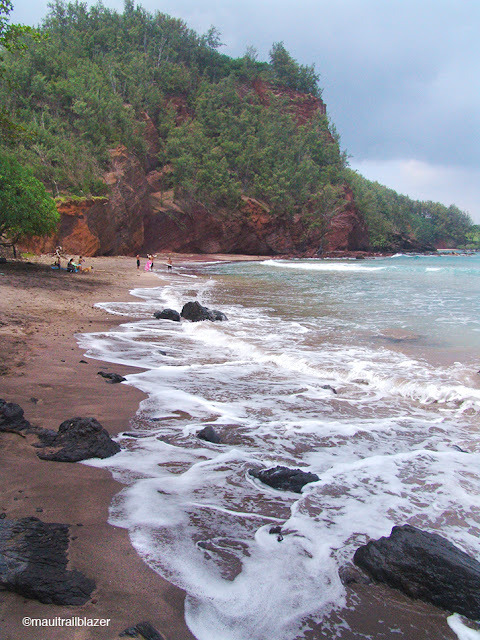 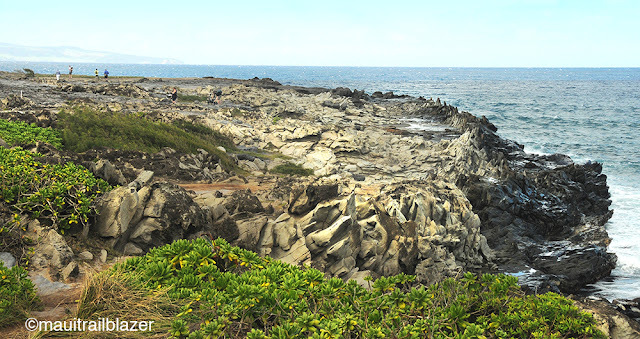 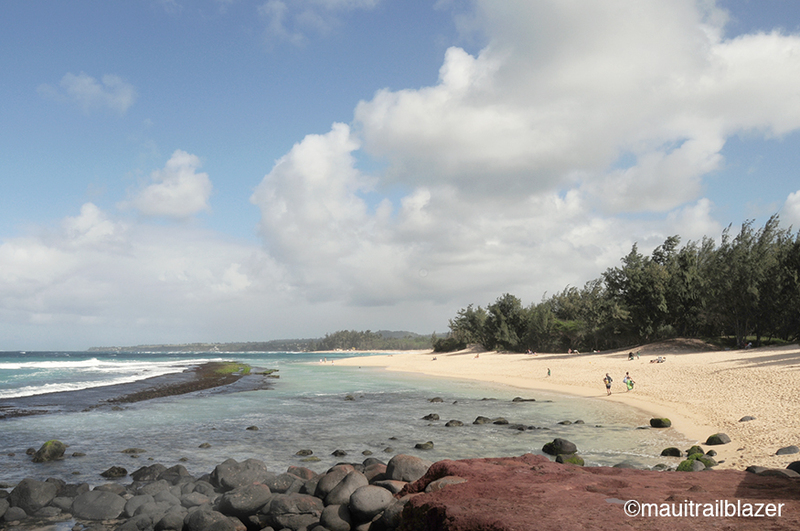 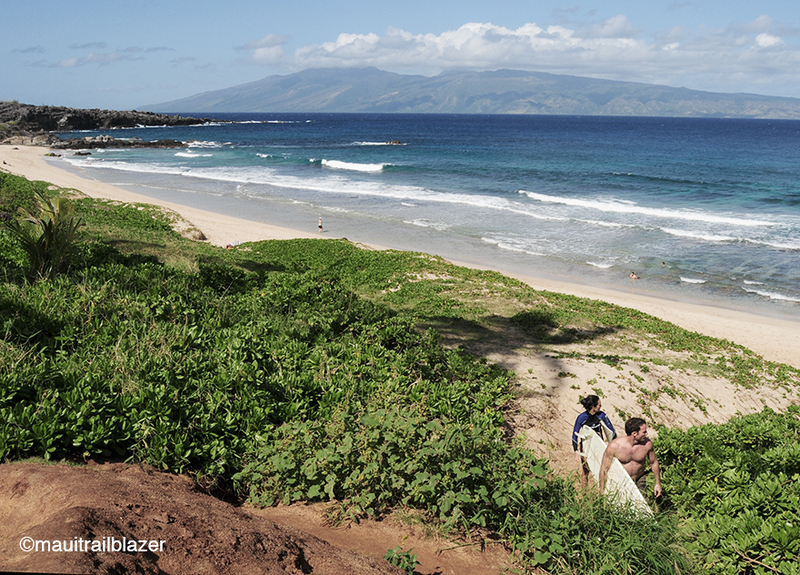 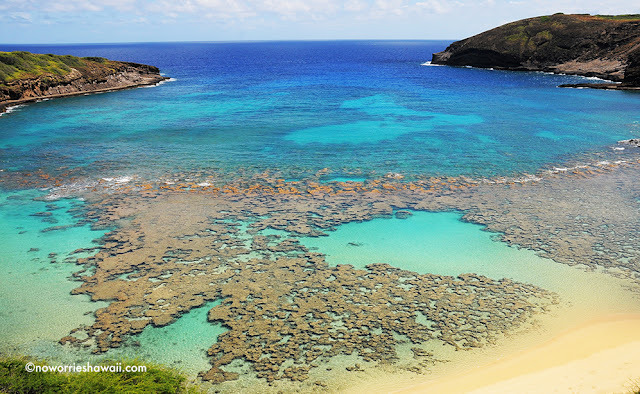 Translated as "Destructive Waters," Wailuku makes for hazardous swimming, and drownings occur. 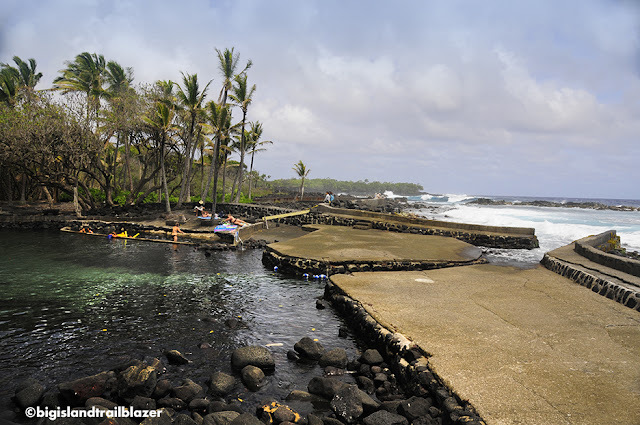 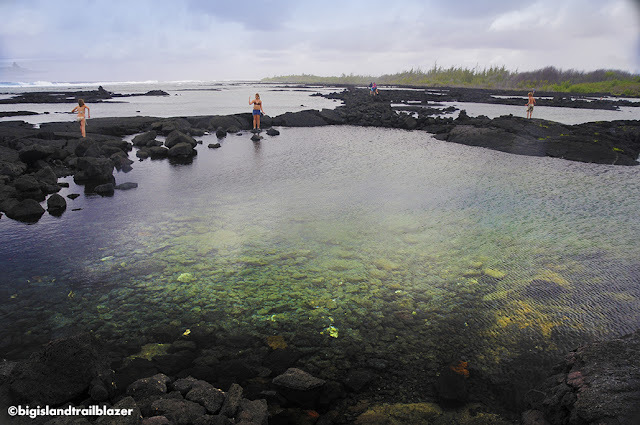 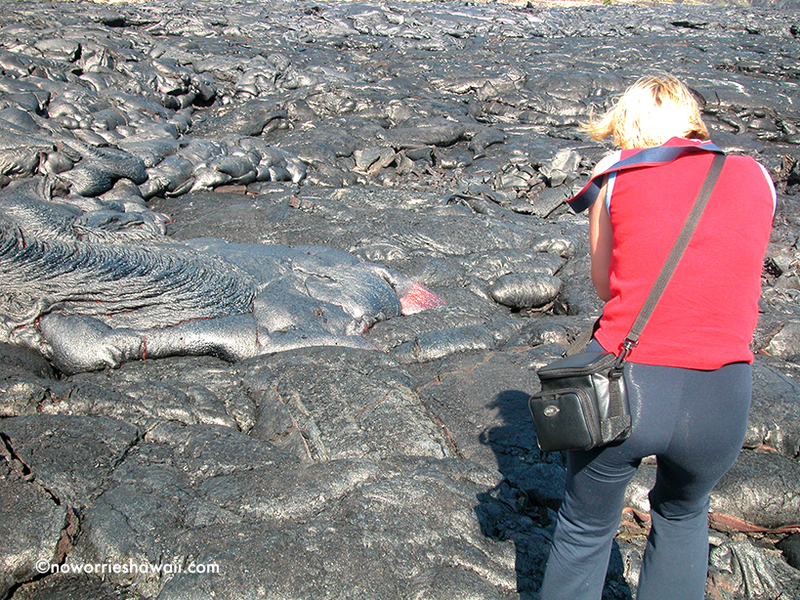 The most dangerous place in the park is Boiling Pots, where white water scours bedrock. Don't ever do what the dude is doing in the picture above. Rainbow Falls is the park's centerpiece. 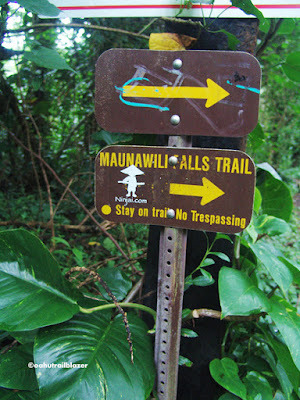 It's on the tour bus circuit. 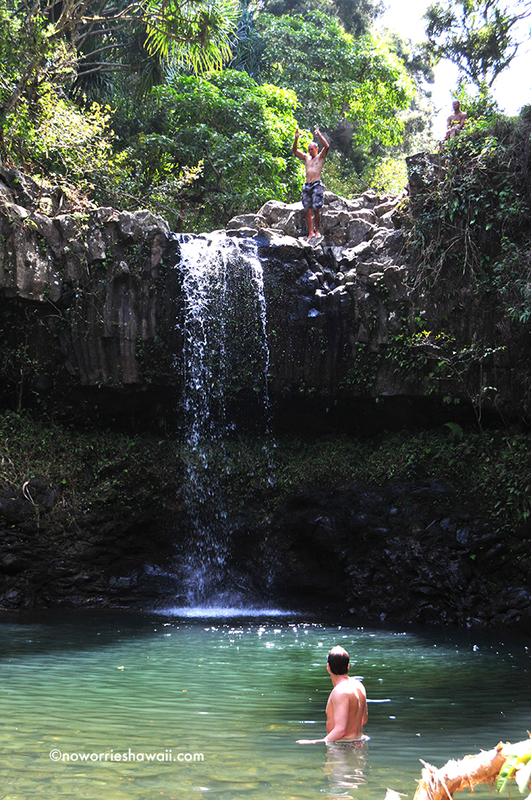 A short trail takes you to the top of Rainbow Falls, where swimming is safe on most days, as long as you stay well back from the edge. 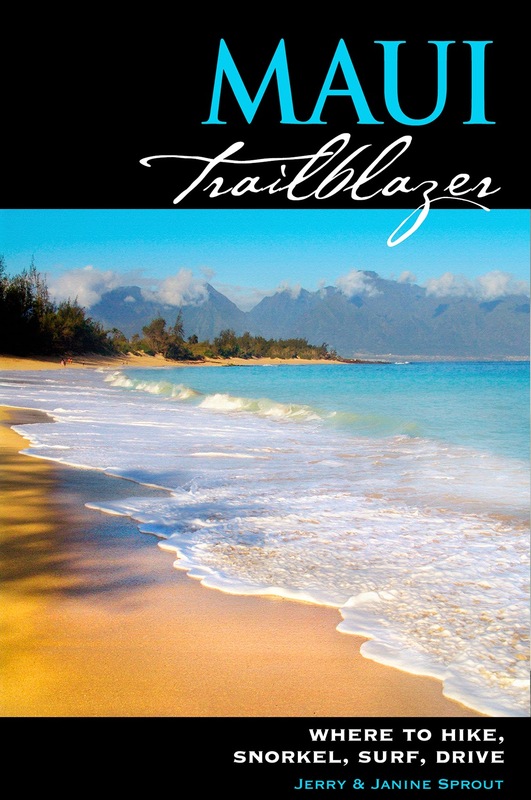 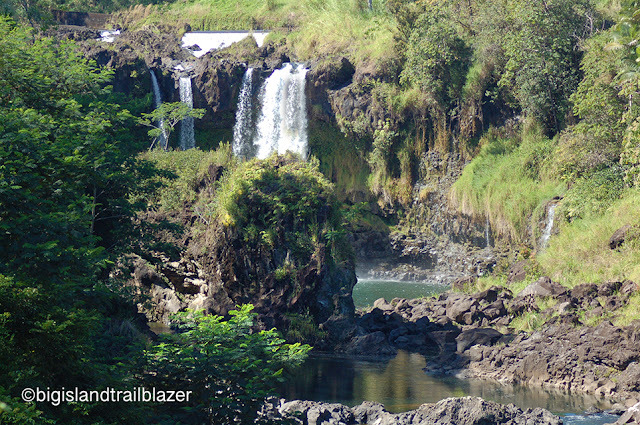 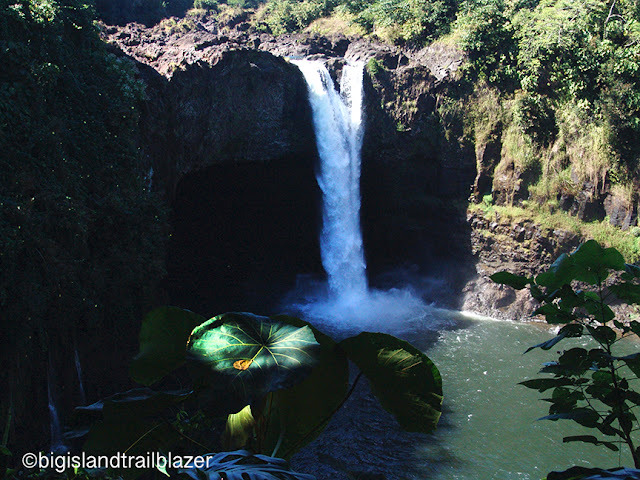 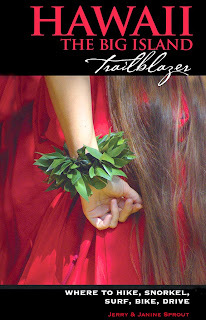 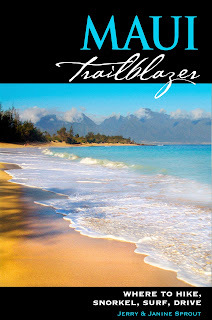 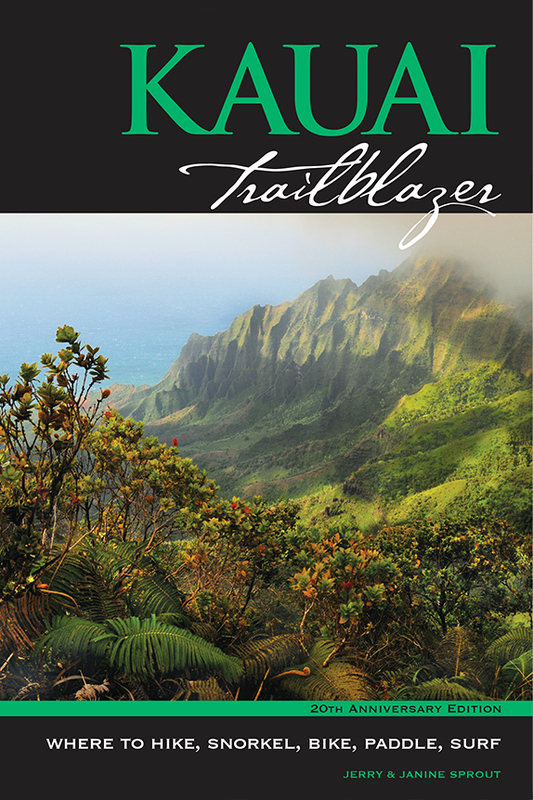 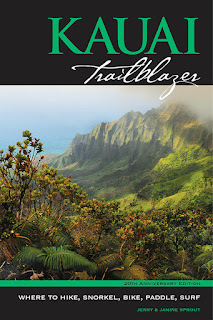 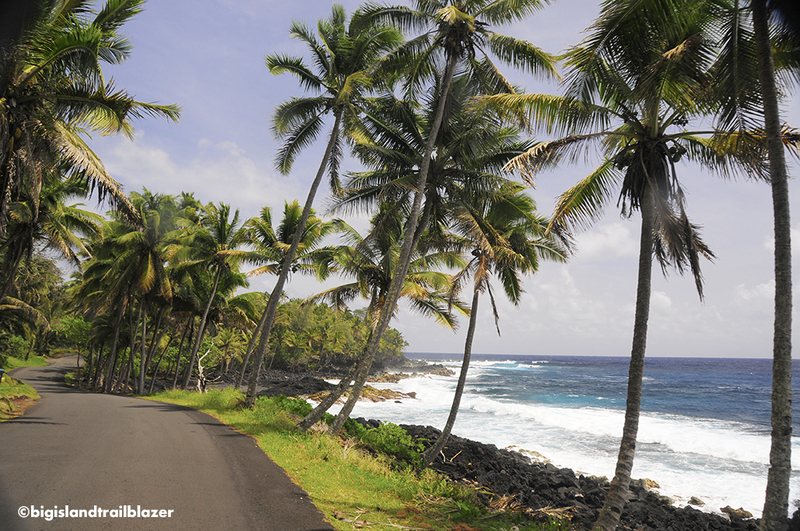 Hawaii the Big Island Trailblazer devotes several chapters on the goings on around Hilo Town. 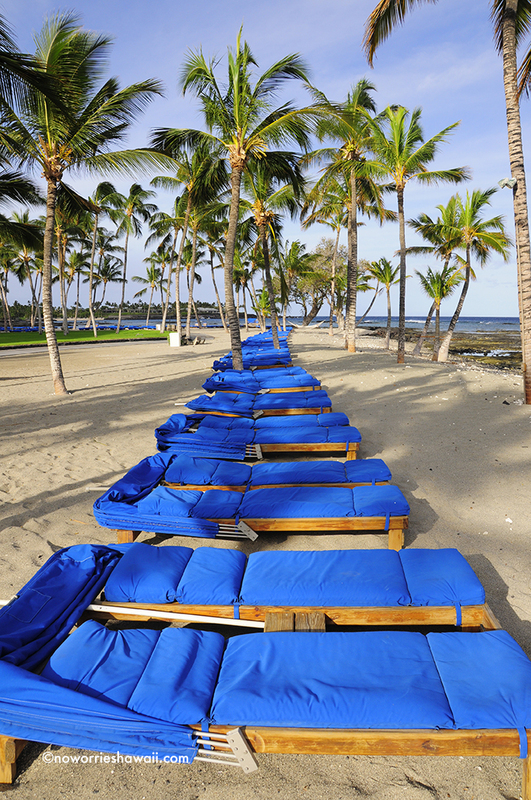 There are several beach parks along the huge bay that are among the best in the state—if you catch them on a sunny day.